After ripping away our labour law improvements with Bill 47, in December the government also tabled Bill 66, the Restoring Ontario’s Competitiveness Act. If this bill becomes law, it will remove a wide range of legal rules meant to protect our communities. Some of the proposed changes directly affect workers’ rights. Help us speak out against Bill 66 by sending this email to the premier. Bill 66 is a clear attack on workers and our communities. With this bill, it would be easier for employers to make us work more than 48 hours a week. Bill 66 would make it easier for employers to make us work overtime without having to pay as much overtime premium pay. It would limit access to reliable pension plans. It would make it more difficult for certain public sector workers to join a union. Also, rules that make sure there are enough childcare workers for the number of children in a daycare would be weakened, decreasing the quality of childcare on which so many workers depend. Early childhood education is a sector that employs mainly women, and these childcare workers are already overworked and underpaid. This bill would only make it worse. The same government that campaigned on being “for the people” does not enforce working people’s rights. They stopped proactive inspections, which are the most effective way to find employers that violate the law. With Bill 47, they lowered fines for employers that violate labour laws by 29%. Now with Bill 66 they want to get rid of the requirement to put up ESA posters to let workers know what they are entitled to. But Bill 66 is not the law yet. Your voice can make a difference! Part of Bill 66 has already been scrapped because of pressure from community and environmental groups. We must keep pushing to completely get rid of Bill 66 and the damage it would do to our province. Visit, call and email your MPP to demand the government stop its attacks on our jobs. Our government thinks businesses will create more jobs by keeping wages and employment standards low. This is not true. After the minimum wage increase was announced in 2017, many business groups predicted huge job losses to try to scare the public. Even the Financial Accountability Office of Ontario (FAO) said the province would lose 50,000 jobs. 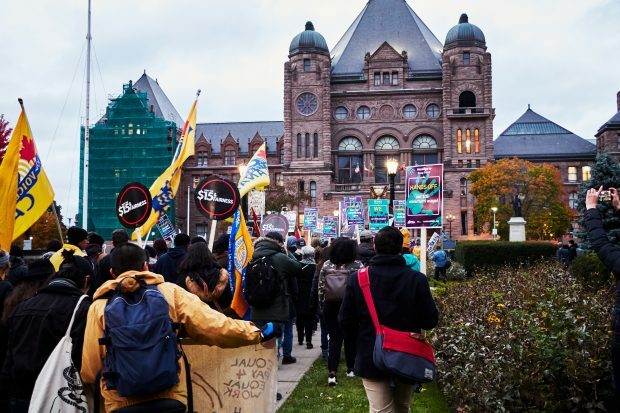 Yet something quite different has happened: One year after a minimum wage increase and improved labour laws, “Ontario’s economy created a solid 114,400 net new jobs,” says the same FAO in their February 2019 report. This proves that what is good for workers is also good for the economy. Better wages and working conditions are the answer. Let’s be confident in our collective power to demand better from our elected leaders. Remember that the voices of thousands of workers had the power to finally win a $14 minimum wage, job-protected leaves* for everyone, and more. The fight for decent work is always worth it. *The wording about leaves has been updated on our Basic Employment Standards factsheet. Please read and share with your communities.